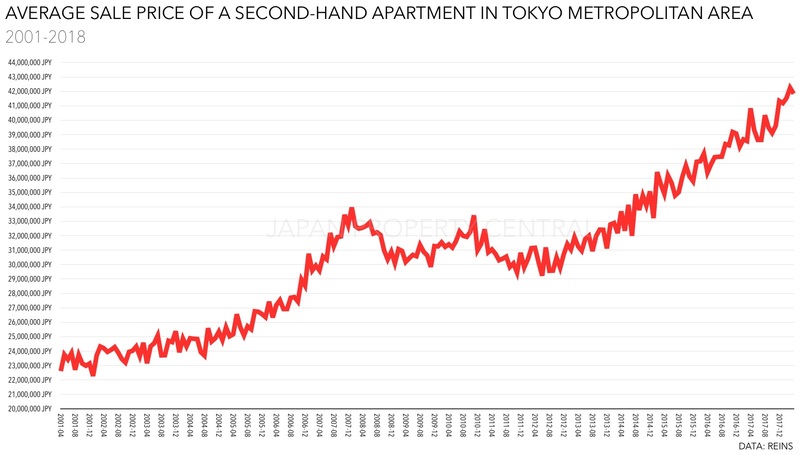 According to REINS, 3,237 second-hand apartments were reported to have sold across greater Tokyo in April, down 15.2% from the previous month but up 2.3% from last year. March is typically the busiest month of the year for apartment sales, so it is normal to see a drop in transactions in the following month. The average sale price was 33,640,000 Yen, down 0.1% from the previous month but up 3.7% from last year. 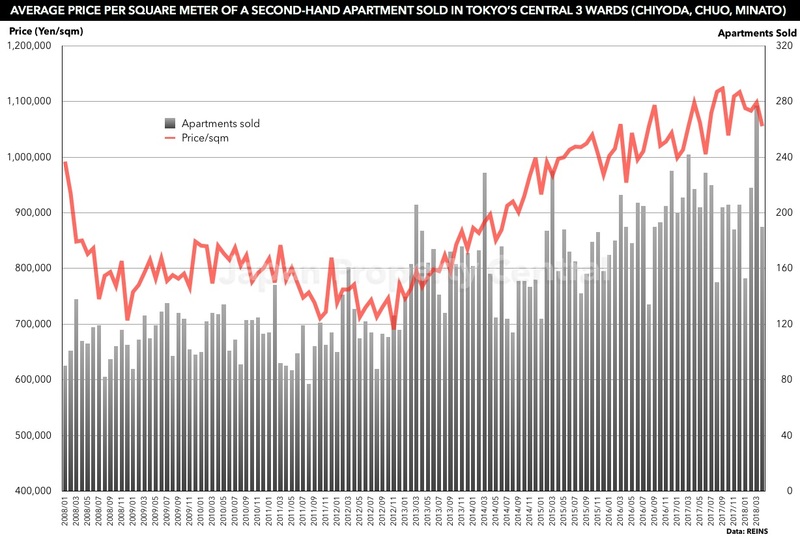 The average price per square meter was 520,400 Yen, down 0.1% from the previous month but up 3.3% from last year. This is the 64th month in a row to see a year-on-year increase in sale prices. 1,679 apartments were sold in the Tokyo metropolitan area, down 15.4% from the previous month but up 4.4% from last year. The average sale price was 41,840,000 Yen, down 1.0% from the previous month but up 2.5% from last year. The average price per square meter was 689,300 Yen, down 1.8% from the previous month but up 1.6% from last year. This is the 67th month in a row to record a year-on-year increase in sale prices. 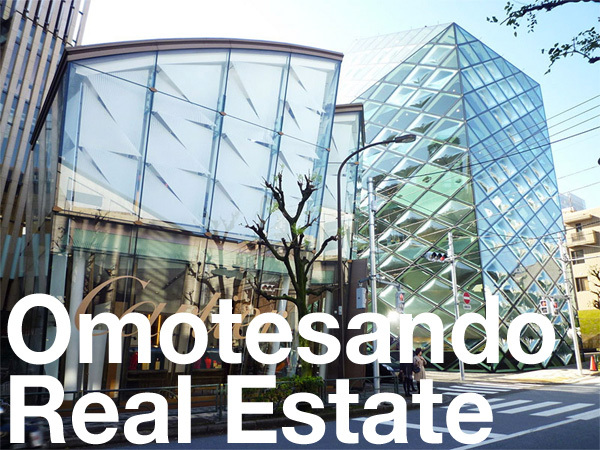 In central Tokyo’s 3 wards of Chiyoda, Chuo and Minato, the average sale price was 60,100,000 Yen, down 3.1% from the previous month and down 4.7% from last year. 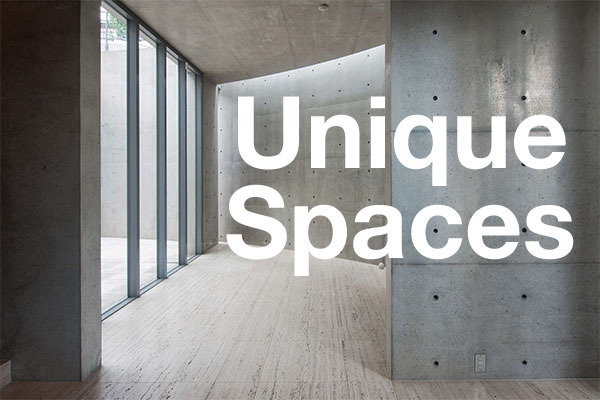 The average price per square meter was 1,055,600 Yen, down 3.9% from the previous month and down 3.8% from last year, ending a 12 month run of year-on-year increases. 190 apartments sold during the month, down 31.4% from the previous month and down 12.4% from last year. New listings for the month were down 5.9% from last year, while remaining inventory shrunk for the 13th month in a row. Source: REINS, May 14, 2018.